We appreciate that the manufacturer was able to preserve the same maximum aperture at 300mm as the 18-200mm at 200mm, or f/5.6, which allows the AF-S DX Nikkor 18-300mm f/3.5-5.6G ED VR to distinguish itself from other 18-and or 18-300mm lenses on the market. But this success comes with a price tag in terms of weight and bulkiness: the lens weighs 830 grams, and is 120mm long with an 83-mm diameter. The Nikkor 18-300mm f/3.5-5.6G ED VR’s optical construction uses 19 lens elements in 14 groups, integrating three aspherical lenses and three UD glass lenses. Its minimum telephoto focus distance is 45cm, which offers a maximum reproduction ratio of 1/3.2 — advantageous for such amplitude, and leading one to consider macrophotography as well as capturing object details. 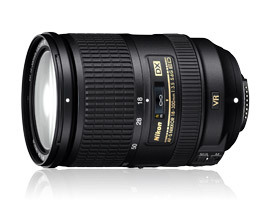 The Nikkor 18-300mm VR will not fit everyone’s budget. Available the end of June 2012, it will be price at 979 euros (tax included). That’s 100 euros more than the 18-200mm VR II and a sales price equivalent to a 28-300mm FX designed for full-format SLRs.